In looking back at it all, I can honestly say I was never afraid or nervous. I don’t know if it was because I had my photography and video work to keep me occupied or what. But I think it was because I totally trusted the system and our operators. They provided a good safety briefing before we boarded the gondola and I saw them go through their safety checklist before each person took the plunge. When it was my turn, I was feeling jovial, maybe even a bit showy as the video below may show, and was excited to drop. Afterwards, we grabbed some lunch and headed up to the top of the glacier covered Mt. Titlis for some beautiful views. This entry is filed under: Air, Earth, Europe, Story, Video. 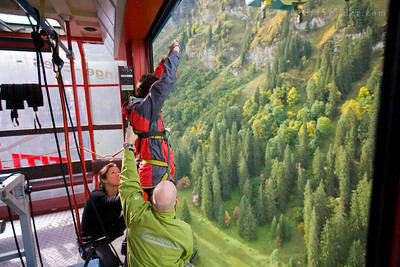 « Swiss Adventure: Canyoning and Hiking and Swinging, Oh My!